Manatee Benefit 2019 - The Manatees need You! The Annual Manatee Benefit for 2019 will be the first week in March - watch for the date and time of The Annual Manatee Social & Benefit - a new venue for this fun event...details will be coming soon! Note that all bid winners are receiving a special packet and US Scuba Gift Certificate which may well be worth more than the items they won at the Silent Auction! US Scuba Center wishes to thank the Rochester Mills Beer Company and staff for such wonderful support of this annual event. THIS YEAR WILL BE DIFFERENT FEATURING AN AMAZING TACO Appetizer Counter. It is a great time to socialize (catch up on the diving adventures of friends), win some fun prizes and Christmas Shopping early.? Help us make this year's turn out the best ever of divers, snorkelers and Manatee Lovers!? As in the past, local businesses and manatee lovers have contributed wonderful times and more items are being added daily. This is a great time to purchase great Christmas Gifts which also make a difference in preserving our delicate and endangered under water world and the creatures that call it home. Proceeds go to the Hubbs Sea World Manatee Rescue & Rehabilitation Program (a non-profit 501 C3 organization) and Save the Manatee Fund. Matt, the manager at the Mills is doing a special Taco appetizer as a new twist and there is a cash bar. Everyone who wins a bid item will get a special goody bag with a special certificate at US Scuba Center. Individual Check Donations - remember that this is a NonProfit 501 C3 organization. Bud and Heather want to thank every person who supports this event by attending and all our great local businesses and friends who donate so generously every year. One of the most impressive marine mammals that Heather Sellick and Bud Uren, co-owners of US Scuba Center have encountered on their travels around the world is the West Indian (Florida) Manatee.? According to Heather, "The Manatee is one of the most magnificent marine mammals that we have seen, it is also the one that tugs at our heart strings and reminds us of the great damage humans have inflicted on the creatures with whom we share this planet."?? What is the fate of the Florida Manatee?? The destruction of the Florida Manatee over the last century has been tragic.? The Florida Manatee Sanctuary Act, the Federal Marine Mammal Protection Act of 1972 and the Endangered Species Act of 1973 protect the Florida Manatee.? For millions of years this gentle giant was once plentiful in the Florida Rivers and coastal waters.? Now even with the protection laws, the Manatee's survival is in serious trouble.? The slow moving Manatee has been known to reach lengths of 13 feet and up to 3,500 pounds.? They evolved from four footed land mammals that entered the water 60 million years ago.? The estimated Florida population of Manatees is now only 4,000.? 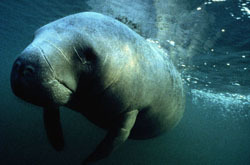 Manatees are herbivores and eat the equivalent of 10% of their body weight daily in sea grasses.? They cannot tolerate water cooler than 68 degrees.? During the winter months when the ocean cools, the Manatees move into the water canals and rivers where the water temperatures are warmer. Several factors have contributed to the decrease in numbers of these wonderful marine mammals all directly attributed to humans.? Encroachment of people on their habitat has affected their food supply.? Pollution has made them more susceptible to virus.? Fast moving boats do not allow the Manatees to move out of the way of propellers and discarded fishing line can be lethal to them. US Scuba Center, Inc.? has been involved with the protection, rescue and rehabilitation of the Manatee for over 16 years.? Once a year, US Scuba Center takes a group to the Crystal River area of Florida and introduces them to the Manatees. The annual program this year will be January 12 - 14, 2012. 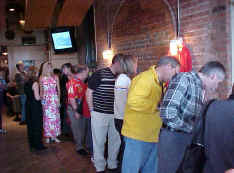 The Manatee Benefit is open to the public, and all Manatee Lovers are invited.? 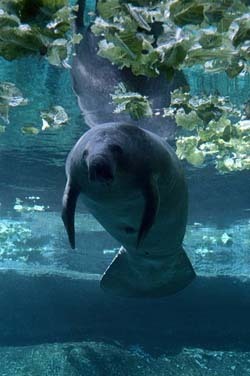 This is a wonderful opportunity to have some fun and work together to get the Manatee off the endangered species list.? If you would like a preview of just some of the items that will be available at the "Silent Auction" view the above list. "to return to the sea some measure of the benefits derived from it."